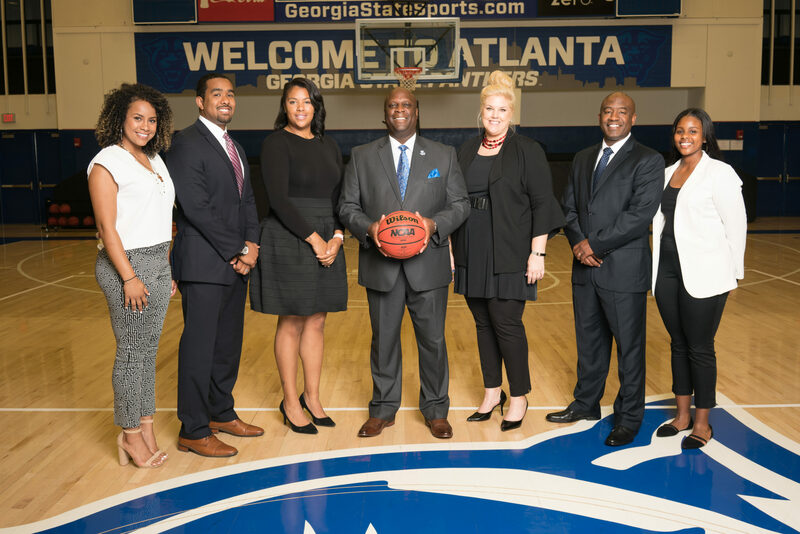 Georgia State women’s basketball is starting off this season with an all-new coaching staff after it didn’t renew former head coach Sharon Baldwin’s contract in March 2018. Gene Hill, acquired on April 19 this year, is now the new head coach of the Panthers. Hill brought over former head coach at North Carolina Central and Winston-Salem State University, A.G. Hall to the staff as an assistant coach. After hiring Hall, Hill recruited former Marshall associate head coach, Katie Pate to the staff. But Pate isn’t new to the Panther family; she managed business operations and academic success in 2014. Hill also picked out former Mercer head coach, Tiffany Morton. Morton coached the program for three years and helped them reach an NCAA tournament in the 2017-2018 season for the first time in school history. She also coached the team to a Southern Conference championship that same year, breaking into the Top 25 in the USA Today’s coaches list. Hall comes with a lot of defensive knowledge. During his tenure as head coach at Winston-Salem State, Hall recorded two 15-win seasons and the team was the No. 2 ranked defense in Division II basketball that allowed only 51 points per game. Hall is in for a treat with two defensive anchors on the Panthers right now. Center Shaquanda Miller-McCray and forward K.K. Williams are two upperclassmen that had a good season on the defensive end of the court last year. Miller-McCray was tied for sixth in the Sun Belt Conference in blocks per game with 1.3. Even though she averaged that many blocks, the Panthers ranked 10th in the conference in scoring defense, allowing 71.7 points per game. Miller-McCray is excited to work with her new head coach and assistant coach this season. She believes that the new staff is working hard for them to not only be better on the court, but also off the court. She also spoke briefly about coach Hall’s philosophy on shot blocking. Miller-McCray also mentioned the expectations that the new coaching staff set for the players. Despite having a new set of coaches, the standards remain the same. “Come ready to practice, every day. Bring the energy, effort and make great choices,” Miller-McCray said. K.K. Williams had the same approach about her newly acquired coaches and how she has created a great relationship with them. Williams also feels good about working with defensive minded Hall and is learning his schemes to become a better defender. “He is always telling me get your hands up, get down and get in the gap, so he is really big on defense,” Williams said. Williams also explained that Gene Hill and the other coaches want defense to be a strength for Georgia State. “Our goal is to basically play straight up defense, be in the gap, play good on-ball defense, get under the screens and just paying attention to what you need to do and executing,” Williams said. Despite having major success in the ACC with both Georgia Tech and North Carolina State, Hill chose to become the head coach at Georgia State. The university’s developments and being a Georgia native influenced his decision. Hill’s decision to bring in Hall comes with some history in this business. Hill and Hall have known each other for 18 years beginning when they were coaches at USC Spartanburg and North Carolina Central respectively. Familiarity is one of the biggest reasons that Hill hired Hall and most of his assistant coaches. With his new team, Hall looks forward to teaching the Panthers all the necessary steps to become a really good defensive team. “The thing that has made me a good defensive coach is basically paying attention to detail and just trying to get the kids to understand subtle nuances of being a good defender,” Hall said. “The basic slides and how to move and how to make the situations work for you. The last time the women’s team had a winning year was the 2009-2010 season. But now, the entire coaching staff has a track record of winning, which suggests they will find success at Georgia State soon. The Panthers may have touched base on every aspect of the game through the coaching picks for this season. With the senior leadership and the new coaches on the sideline, the women’s basketball team looks to find an identity they can stick with throughout this upcoming season. With Hall teaching his players the different schemes of his defense, the Panthers’ potential should be much higher than last season’s. Georgia State begins its season on Friday, Nov. 2 against Shorter at the GSU Sports Arena at 7 p.m. Before the Panther’s Sun Belt schedule begins on Jan. 3, its non-conference slate features games against Georgia Tech (GSU Sports Arena, Dec. 2), Kennesaw State (GSU Sports Arena, Dec. 13) and Florida State (Tallahassee, Florida, Dec. 29).